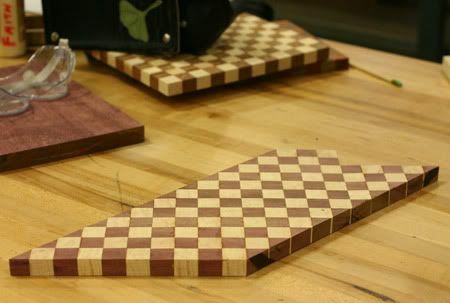 Woodworking was fun this week. I spent a lot of time gluing stuff together. 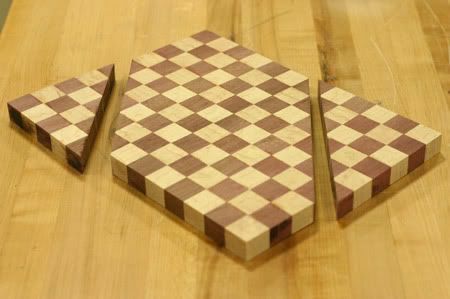 I just realized that I never explained my plan for the new jewelry box lids: the lids are going to have center panels made up of diamond shapes banded by walnut. 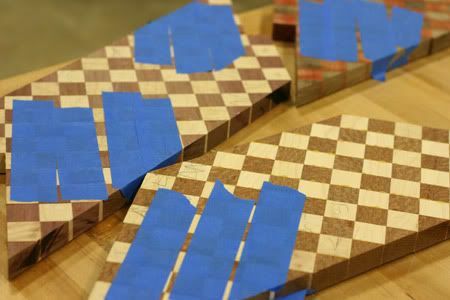 I'm turning these panels 45 degrees so the lids will have a diamond pattern instead of a checkerboard. But if I turn them on a angle there isn't enough surface area to cut out a large enough rectangle. So I cut off the corners. And then I glued them onto the edges so I can cut a bigger rectangle out of the middle. I couldn't use clamps because of the angles involved, so I tightly stretched masking tape over the joints while the glue dried. I was kind of dubious this would work but my instructor said it's what they do in situations like this. 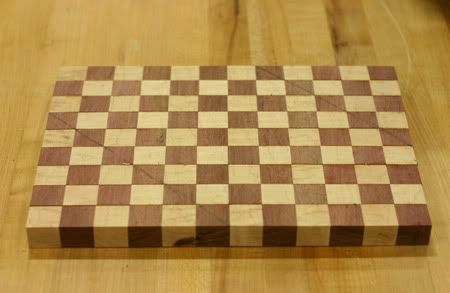 But this cutting board is special--after it's finished I'm going to have a giveaway and one of you lovely readers will win it! 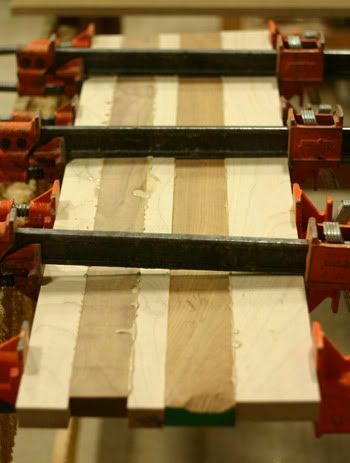 I wanted to say thanks for visiting my little corner of the internets and following my woodworking adventures. And I conveniently had a bunch of wood leftover from the other cutting boards. I wish I could make more than one for the giveaway but class time is already short as it is. It'll be a couple of weeks before it's finished, but be sure to check back for it then. Later this afternoon I'm dressing E in his dog costume and taking him by N's office for their Halloween party. Pictures on Monday. Have a happy Halloween!